Who said you couldn’t have candy for breakfast? Fried Egg Gummies are one of our most popular pick ‘n’ mix candies. Even if you don’t like eggs, you are sure to love these because they don’t taste like egg. They were invented by Haribo, a German company in the mid 20th century. The popularity of this sweet is partly due to the two different textures of gummy that it has. The “yolk” is made out of a harder gummy, whilst the “egg white” is made out of a softer gummy with a marshmallow-like texture. That’s all for Fried Egg Gummies! In a few weeks we will be posting part 3 of our gummy series featuring gummy bears. Until then, we look forward to seeing you stop by our stores in Central and Wan Chai and buying Fried Egg Gummies along with some of your other pick ‘n’ mix favourites. Where would we be without gummies? Gummies are a staple of the pick ‘n’ mix selection and one of the most important of the 5 candy food groups so we decided to dedicate 3 posts to the history of gummies and teach you some must-know facts about some of the most popular Gummies. The first soft gummies were created in the 19th century by boiling sugar and fruit with Gummi arabicum (the resin of a type of acacia tree). Over time, the Gummi arabicum was replaced by gelatin to give gummies a softer consistency. It was then that the gummy we all know and love today was created. Have a craving for gummies? Come visit our store and buy some of your favourites from our vast selection of gummies. We have gummy cola bottles, dolphins, fangs, rings, cherries, worms and much more. Whether you’re a fan of sweet or sour, hard or soft, we are sure to have something for you! In the next few weeks we will be posting part 2 and 3 of this series so be sure to come back and check those out! In the meantime, share this post with all your fellow gummy lovers and convince those who don’t that gummies are a force to be reckoned with. Last stop: 1960s and 1980s. Oh what a time it was to be in!! The Beatles rose to fame, the Mary Poppins movie was released and best of all sweets such as Flying Saucers, Rhubarb and Custards and Wham bars were created! Flying Saucers are our signature candy and in 2004, Flying Saucers were voted Britain’s all-time favourite sweet. But what are Flying Saucers exactly? These colourful discs are made from a rice paper sandwich with sherbet filling. Yum! This list would definitely not be complete without the British sweet shop essential, Rhubarb and Custard. Created by Jim Banard, a factory worker, in the 1960s, Rhubarb and Custard is a sweet and sour boiled candy that contains neither rhubarb nor custard. Wham bars are raspberry flavoured chewing bars known for their tongue-tingling fizziness. They were created in the 1980s and were so popular that over 30 million were sold each year in the 80s. They were also well-known for their neon pop art wrappers. It’s supercalifragilisticexpialidocious! You are now an expert on Britain’s most loved sweets, so share your knowledge and our blog posts with your friends and family. Hopefully you enjoyed our journey and don’t forget to check back regularly for more posts. The 1950s saw the launch of mouthwatering sweets such as Drumsticks and Love Hearts. Drumsticks are raspberry and milk flavoured chewy lollipop. They were created by the Swizzels-Matlow Company in 1957, Derby, England. At the time it was created, it was the only chewy lolly in the world. It is said to have been invented by accident when the son of one of Swizzels-Matlow’s founders was experimenting with a new machine and discovered it was possible to create a lollipop with two different flavours. No wonder why it is so popular: double the flavour, double the goodness! Love Hearts, how sweet. Don’t you just love some Love Hearts? Love Hearts were launched by the Swizzels-Matlow company in the 1950s. The were originally used as Christmas cracker fillers and were not 3 dimensional. Only in the late 50s did Love Hearts become 3 dimensional. Did you know Princess Diana was one of the few people to ever get customized Love Heart sweets? She received them when she visited the factory in 1990. They had the names of royals stamped on them such as “Prince Harry” and “Prince William”. Sweets are the way to anyone’s heart! Be sure to visit our stores in Central and Wan Chai and buy your Drumsticks and Love Hearts! Also, don’t forget to check our blog in a couple of weeks to learn about Britain’s favourite sweets from the 1960s and onwards. Fruit Salads. Black Jacks. Sherbet Fountains. What do they have in common? These scrumptious sweets were all invented in the 1920s. Fruit salads are raspberry and pineapple flavoured chews first created by Barratt’s in the 1920s. Their iconic yellow and pink wrapper became synonymous with pick ‘n’ mix throughout the decades making Fruit Salads a staple British sweet. Black Jacks are known as the “big brother” to the Fruit Salads. They were first created in the 1920s, just like the Fruit salads. Unlike the Fruit salads however they are aniseed flavoured chews that turn your tongue black!! Smiling Golliwogs used to be on the Black Jack labels. However, they were discontinued in the 1980s due to racial controversy. Sherbet Fountains are a sour-like flavoured sugar that were launched in 1925. Since then Sherbet Fountains have been a beloved British sweet. In 2009, its paper packaging was replaced by a tube with a twist off lid much to the disappointment of some who grew up with the original packaging. Nonetheless, the candy is still just as delicious! That’s it for the sweets of the 20s. In a few weeks we will be posting "Britain’s most popular sweets: 1930s and 1940s". The 1900s and the 1910s saw the conception of Wine Gums, Gobstoppers, Aniseed Balls and Jelly Babies! Scroll down to find out all you need to know about these delicious sweets. Wine gums were created in the 1900s and although the name suggests otherwise, they do not actually contain wine. According to the company Maynard, they were invented because Charles Gordon Maynard wanted to create a sweet to appeal to adults but not upset his teetotal father. Hence, wine-less wine gums were spawned. Gobstoppers have existed for around 100 years although it is unknown who originally invented them or specifically when they were invented. 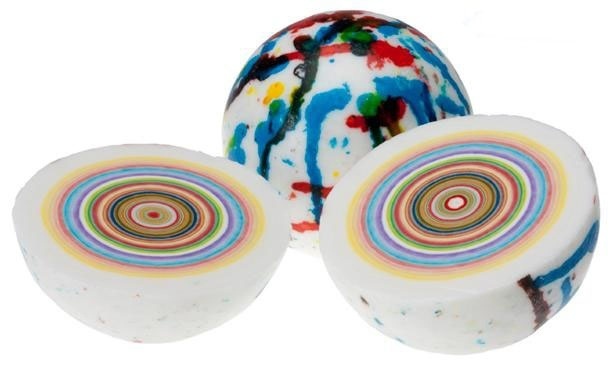 Gobstoppers are round, very hard balls of layered candy. Traditionally, Gobstoppers are about 1-3cm in size but now they come in all different sizes with the bigger ones being up to 8cm in diameter. The biggest of Gobstoppers can take days to finish!! Gobstoppers were a favourite of British school boys during the interwar years. Because of their role in Roald Dahl’s childhood, Gobstoppers were also featured in his book, Charlie in the Chocolate factory. In his book, Roald Dahl created “Everlasting Gobstoppers”, fictional Gobstoppers that can never be finished. Unfortunately, Gobstoppers that can never be finished do not exist as of yet. Nevertheless, Gobstoppers take so long to finish the fun never ends! Aniseed balls were created in the 1910s and are made from aniseed oil. Aniseed balls were popular with children during the first and second world wars. Apart from being a food stuff, Aniseed balls were also used as a time delay for setting off explosives in Limpet mines during World War 2, giving soldiers an edge against the Nazis. A Limpet mine was an explosive weapon meant to be attached to the bottom of a ship by a diver. They only problem was, the Limpet mines kept going off too quickly not leaving enough time for the diver to swim away. The solution? Aniseed balls! Because Aniseed balls dissolve slowly in water, it allowed the diver enough time to escape before the Limpet mine exploded. Aniseed balls were used during the second world war. Jelly Babies on the other hand were created to celebrate the end of the first world war. In fact, they were first launched by Bassett’s in 1918 as “Peace Babies”. It was only in the 1950s were they re-launched as Jelly Babies. Fun fact: Fans of the Beatles used to throw Jelly Babies at the Beatles after it was revealed that Jelly Babies were George Harrison’s favourite. That’s it for the most mouth-watering sweets of the 1900s and the 1910s. Don’t forget to check regularly for new blog posts. We'll be posting a new one every few weeks. Next up: the sweets of the sweets of the Roaring 20’s. 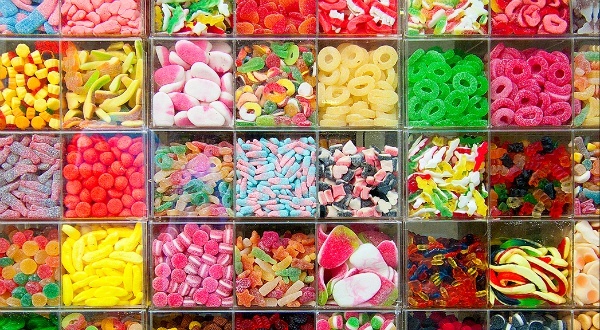 Ever wondered how certain sweets came to be or when they were invented? Then this blog is just for you. This post is the first in a series of blog posts about the history of some of Britain’s most popular sweets. First stop: Pre-1900s. Barley sugars are boiled sweets and are made from boiling down refined candy sugar with barley sugar, cream of tartar and water. They are a time-honoured British sweet, but did you know they were not actually invented in Britain? In fact, they were first created by the Benedictine monks of Moret-sur-Loing, France in 1683. Pontefract cakes are thick liquorice discs with an image of Pontefract castle stamped on them. They were originally created in the 17th century in a town called (yup, no surprise there) Pontefract in Yorkshire. No. These are not made from rocks. Stick of rocks are actually sticks made from pulled candy and have been around since the 1800s. They are a must have sweet for a trip to the British seaside and are commonly found along boardwalks and piers of British beaches. The best part about them is that they come in all colours and designs. Images and lettering can be put in the centre. Nowadays, there are even places where you can get customised sticks of rock! 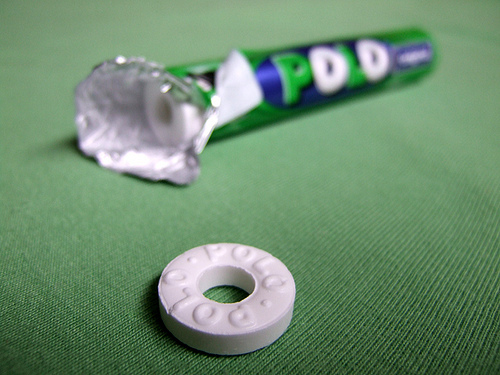 Pear drops are boiled sweets that were created in the 19th century. Only the pink ones are pear flavoured though. The yellow ones are banana flavoured. Although they are pear and banana flavoured, they do not actually contain pears or bananas. Fruit pastilles are a British favourite but are also very popular internationally. In Australia they are known as “Wonka Fruit pastilles”. They come in 5 different flavours: blackcurrant, lemon, strawberry, lime and orange. Yum! 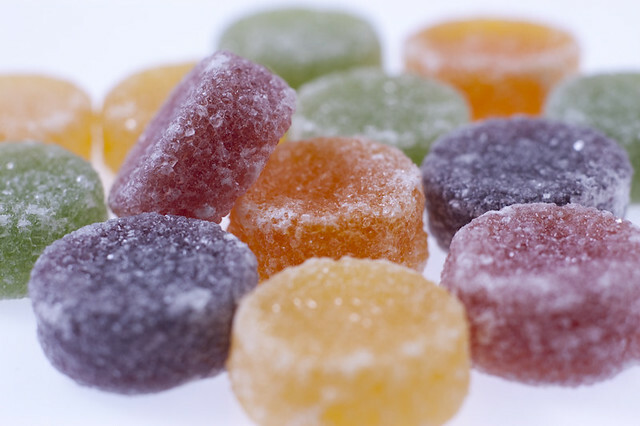 Fruit pastilles were first produced in 1881 by Rowntrees. At the time, Rowntrees brothers, Henry and Joseph Rowntree, were running the business. Rowntrees is also well known for their other creations like Kit Kats, Smarties, Fruit Gums and more! Humbugs are a classic British sweet. They are striped black and white and are a peppermint flavoured mint. Humbugs have been around since the 1800s. 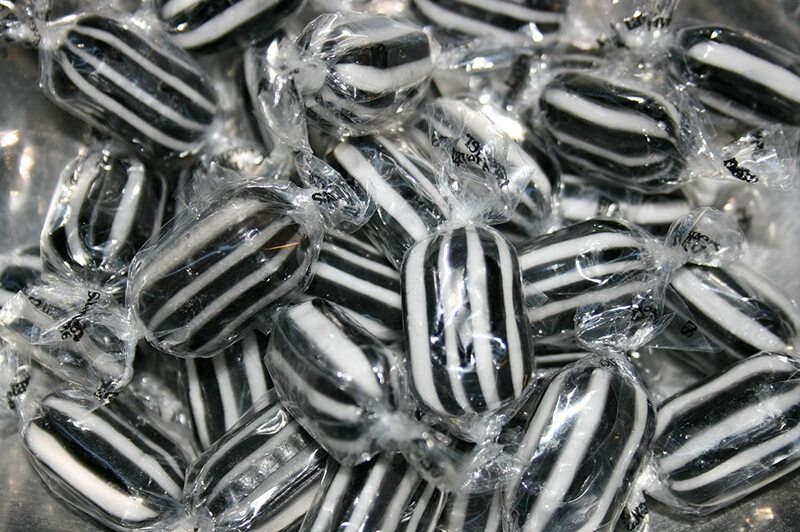 Everton mints are similar to Humbugs because they are also striped black and white but they have a toffee filling. Everton mints were created by a woman from Liverpool named Mother Noblett who ran a sweet shop close to the Everton football ground. She created the Everton mints black and white to match the team colours of the Everton football club. Soon, the Everton mints became synonymous with the Everton football club. In fact, before each game, a girl would walk around the football pitch tossing Everton mints to the people in the stands, for free! Liquorice Allsorts - a beautiful combination of colours and patterns. Pink, blue, yellow, orange, white and black. In fact, that is how they came to be! They were created by Bassett’s in 1899 when a salesman named Charlie Thompson accidentally dropped a tray of samples he was showing a client. What a lucky mess that was, because the client loved the mix-match of colours and thus, Liquorice Allsorts were invented. Hmmmmm….. Aren’t you hungry now? Well if you are, (or even if you are not) make sure to visit the Mr Simms sweet shop in Central or Wan Chai and buy some of these sweets. Also, don’t forget to check this blog in a few weeks where we will be posting a guide to Britain’s most popular sweets (1900s and 1910s). Hello from Mr Simms Olde Sweet Shoppe! Hello! We are Mr Simms Olde Sweet Shoppe - an old fashioned sweet shop selling all the very best traditional British sweets, including Flying Saucers, Sherbet Fountains, Gobstoppers, Kola Kubes, and much much more! We are passionate about our confectionery and want you to join us on a nostalgic trip down memory lane. Over the next few months, we will be writting regular blog posts about your childhood favourite treats, starting with sweets created before the 1900s.